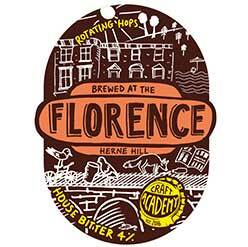 The Florence has a long history of being a brew pub. Formally the home of Head in the Hat brewery; a heritage brewery that proudly called us their home until 2015. 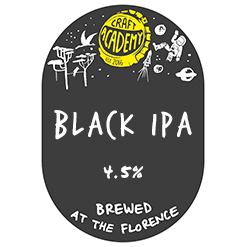 Continuing this rich history we are proud to welcome Craft Academy as our new in house brewing team. Craft Academy is an amazing new start-up offering apprenticeships for burgeoning new brewers. Providing the equipment, knowledge and support to get them started on a career in craft beer making. 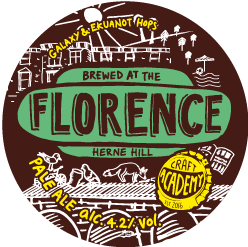 The Florence brewery affords them the opportunity to brew and test new recipes, learn about branding and to see how their finished product works in the market place. They can also interact with customers and get valuable consumer insights on their products. Their unique creations will be available on our bar in regular rotation so come down, say hello to our amazing Craft Academy apprentices and try some of their exciting and flavourful brews. Since joining the Craft Academy, Dan has had hands on experience in all the areas of this dynamic and exciting venture, from creating unique recipes and organising events. Dan has recently launched his first beer, Ice Breaker, a heavily dry-hopped unfiltered pale ale, using Citra and Simcoe hops. Originally from Sheffield, now living in Hackney, Dan is a musician on the side. True harmony for him is sipping on his favourite beer while making and eating pizza. Since joining the Craft Academy, Archie has been very busy in the world of beer! From Sales, event planning and the wonder of brewing it really is a young man’s dream. Under the wing of mentors Dan and Nancy, Archie has an ever progressing role to play in making the beers we serve here at the Florence so great. Originally from Gloucestershire, Archie moved to Paris to work as a nanny at the age of eighteen, until deciding his time had come to head back across the channel to pursue a career in beer!